The faAB Six, headings that have been uniquely designed to slip easily onto a decorative rod and, with no fuss (or design experience), they’ll hang in beautiful folds across the window. An innovative ready-made heading. 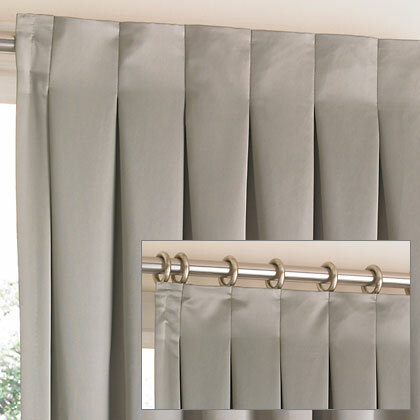 The faAB Pleat has been designed to look like a custom-made pleat panel. The exclusive design features hidden tabs on the back of the heading. When shirred on to a drapery rod, soft folds are created across the face of the drapery. 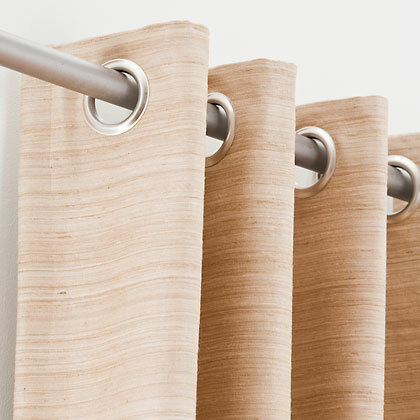 The panel is simple to hang, no hooks, no I-beams, no rings required. Ten 3-1/2" (9 cm) loops which have been sized to accommodate a 1-1/4" (3 cm) drapery rod. The loop is sewn on to the heading 1" (2.5 cm) from the top edge of the drapery. 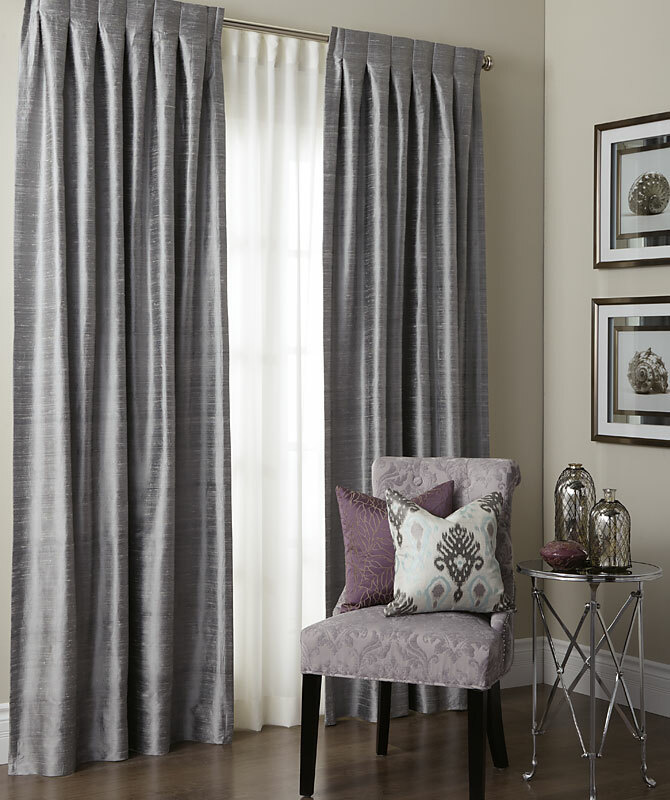 This is called a take-up and is a standard custom drapery feature. Once installed, the take-up hides the brackets of the drapery rod. 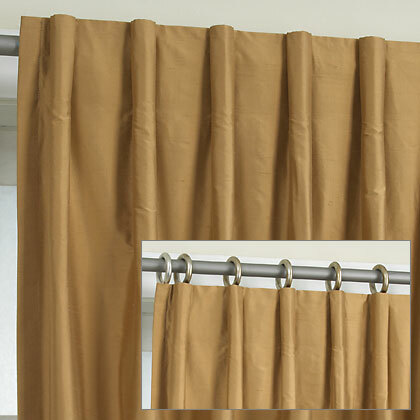 Package of 10 pin hooks is attached to back of drapery for use with rings. 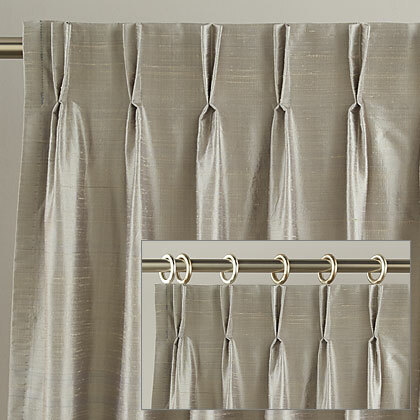 Use the tabs on the back of the faAB Pleat as a guide for pin hooks. 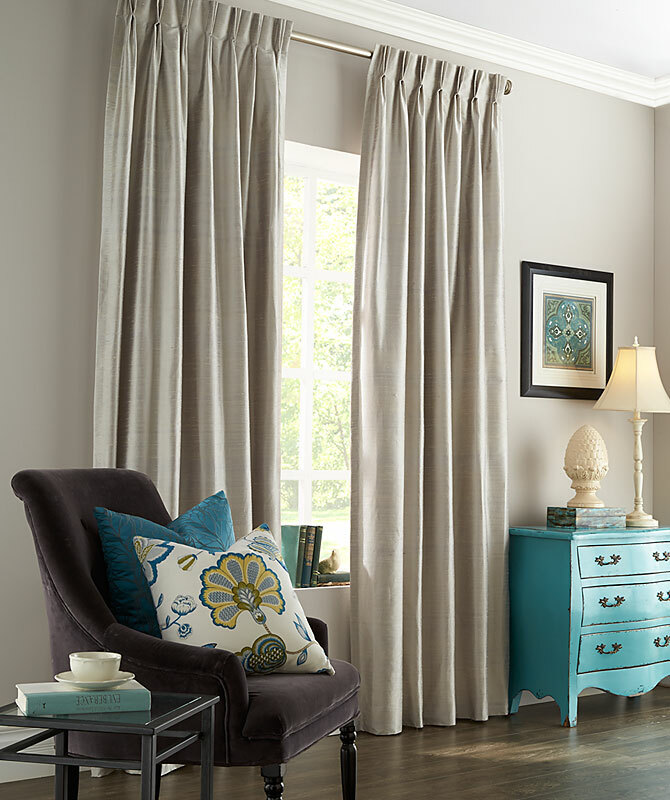 The modern clean look of grommets work beautifully with any décor. 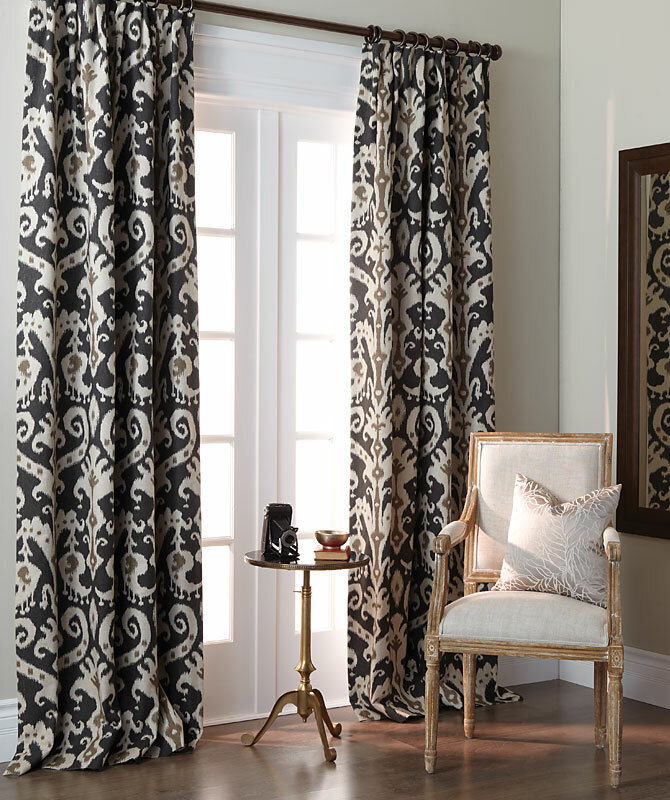 The grommets are evenly spaced across the heading of the drapery and when woven on to a rod, structured columns are created across the face of the drapery. To keep the integrity of these folds, do not extend the drapery more than 16" (40 cm). Note: Coverage of a Grommet panel when fully extended is only 36" (90 cm) across the rod. Eight metal grommets in brushed nickel. The overall dimension of each grommet is 2-1/2" (6 cm). The edge of the grommet is 1/2" (1.25 cm) wide and has a 1-1/2" (4 cm) centre. Perfect for a 1-1/4" (3 cm) drapery rod. There is a take-up of 1" (2.5 cm) from the top edge of the drapery to the top inside edge of the grommet. Account for this when installing your drapery rod. Grommets are also available in Black, Gold and Antiqued Gold finishes. 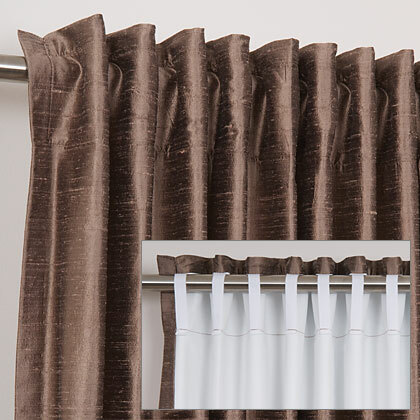 We’ve sewn seven beautifully constructed goblet style pleats onto the face of the panel so it looks just like a custom-made pleat panel when hung on a rod. The pleats are perfectly spaced and fixed so that the beauty of the folds remain even when the panels are drawn or closed. On the face of the drapery, seven 4" (10 cm) long fixed, goblet style pleats. On the back, nine simple tabs. Each tab is 4" (10 cm) long, large enough to accommodate a 1" (2.5 cm) to 1-1/2" (4 cm) decorative rod. Across the top edge the panel has a finished width of 27" (68 cm) when fully extended. Package of 9 pin hooks is attached to back of drapery for use with rings. Perfect Pleat II available 6" (15 cm) long. We’ve taken the best features from the faAB Pleat and incorporated it into the Inverted Pleat. 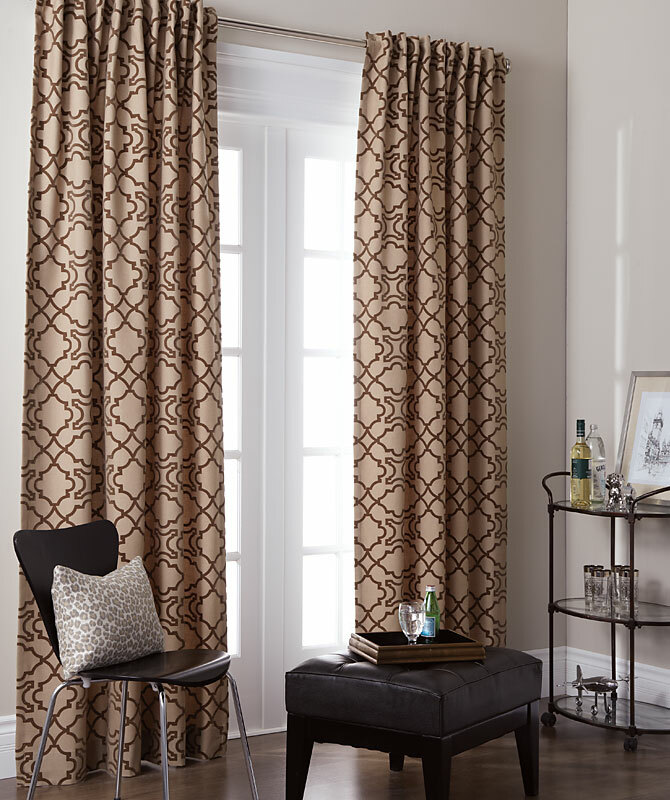 This exclusive heading is a modern twist on a classic drapery heading. 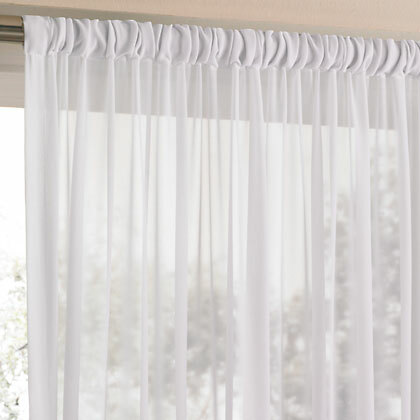 The innovative ready-made styling makes this sophisticated drapery very easy to install. Seven 4" (10 cm) long, fixed and hidden goblet style pleats. Each tab is 4" (10 cm) long, sized for a 1" (2.5 cm) to 1-1/2" (4 cm) decorative rod. Finished width of heading is 27" (68 cm) when fully extended, 4" (10 cm) self-lined heading, 4" (10 cm) blind stitched hem and 1" (2.5 cm) blind stitched side hems. Package of 9 pin hooks is attached to back of drapery for use with rings. Inverted Pleats available 6" (15 cm) long. We’ve sewn seven beautifully constructed pinch style pleats onto the face of the panel so it looks just like a custom-made pleat panel when hung on a rod. The pleats are perfectly spaced and fixed so that the beauty of the folds remain even when the panels are drawn or closed. On the face of the drapery, seven 4" (10 cm) long fixed, pinch style pleats. On the back, nine simple tabs. Each tab is 4" (10 cm) long, large enough to accommodate a 1" (2.5 cm) to 1-1/2" (4 cm) decorative rod. Across the top edge the panel has a finished width of 27" (68 cm) when fully extended. Package of 9 pin hooks is attached to back of drapery for use with rings. Designed for lightweight sheer fabrics. Simply shirr the drapery unto a rod. For best results, use two times fullness across the rod. This will ensure a custom look and additional fullness will provide privacy. The heading features a 2-1/2" (6 cm) pocket across the top edge of the panel. It has been designed to fit comfortably onto a 1-1/2" (3.8 cm) drapery rod or the Add-a-Rod. © 2019 faAB HomeFashions Ltd. All rights reserved.